It doesn’t get much better than this for superhero-themed movies. Marvel rolls out the first of its two films this year, delivering a one-two punch with the third film in the Captain America series. And it delivers one epic beat down, as heroes battle one another in a world where government control splits the Avengers into pieces. A lifelong fan of Captain America, I really didn’t think his film adaptation would work out. The first film, which was good, didn’t fully knock it out of the park. That all changed with Winter Soldier. The Russo Brothers brought a new, complex dimension not only to the character but to the Marvel universe. Civil War is a direct follow-up to that sequel, and delivers a more solid story. After an operation in Africa goes wrong, leaving several civilians dead, the governments of the world unite to demand a United Nations panel take control of superheroes on Earth. Although the film doesn’t really specify just how many people join this cabal, it focuses specifically on Tony Stark and Steve Rogers, two friends who are divided over the issue of government oversight. Stark believes its important, while Rogers fears it will only hinder their efforts. On top of that, Cap’s old friend, Bucky (aka the Winter Soldier), is suspected of a terrorist attack. Captain America aims to bring him in alive, while the authorities aim to take him out. As Cap and Iron Man’s rift grows bigger and more violent, a secret plot is discovered that suggest the Winter Soldier was framed. Rogers sets out to prove Bucky innocent, while Stark works to stop them. He forms a team, which includes Spider-Man and Vision. Rogers gathers together his own ground, which includes Ant Man and Hawkeye. I don’t really want to get into too many details. There are a lot of them, and I don’t like spoilers. Civil War directly tackles an interesting point. How do governments and superheroes co-exist? It’s an interesting question, and a reasonable one. And that’s what makes this film so well crafted. The film plays out this debate, but never takes its eye off what matters: the characters. Captain America and Iron Man are at odds for very real, logical reasons that are very true to who they are. Their motives are clearly defined, understandable, and not so clear cut. While the audience may disagree with Cap or Iron Man, it’s not to easy to disregard their reasons. What makes Civil War work so well is its treatment of the characters. Yes, its a Captain America movie, but everyone here has a purpose in the story. They all have their moments. The Russo Brothers handle the ensemble with a skilled touch. From Vicim and Scarlet Witch, to Falcon and War Machine. Each person matters, each character has a place. They deftly weave in a large assortment of characters with a story that gave each of them room to play and grow. There are three moments people are likely to focus on as their talking points when it ends, if the audience I saw the film with are any indication. The first two are the introductions of Black Panther and the Marvel universe’s Spider-Man. Tom Holland debuts as the Web Slinger, and he does it with charm. He’s the character we’ve come to love, but brings a freshness that was a relief. Spider-Man is a tough nut for Marvel to crack. It’s been invented and reinvented in the last decade, with mixed results. To reimagine a character like that yet again will not be easy. But, if his appearance here is any indication, they may be on the right track. Black Panther also shines. I can’t think of anyone walking away from this not excited for the his standalone film. Chadwick Boseman was great as Jackie Robinson in 42, but he really delivers in Civil War. The only bad part is that we have to wait until 2018 for his movie. The other takeaway is the epic fight between all the characters that takes place more than midway through the film. It’s thoroughly entertaining. Each one gets a moment to shine. Its a dazzling display. At the same time, it goes on perhaps a little too long. It also lacks real consequence. It’s not that the battle doesn’t matter, but its clear that each super hero isn’t really trying to hurt the other. Iron Man, War Machine, Black Panther, Black Widow. They are all battling, but none of them actually want to win. There’s a very real reason for them to be fighting, and it makes sense, but because they’re all also trying to be so nice about it there’s no real threat. Of course, that doesn’t mean it ends nicely. It’s just that the overall sequence lacks gravitas. The film does have a few drawbacks. It a little slow at times. There’s also some points which probably could have used a little more clear explanation. But these are mostly minor. 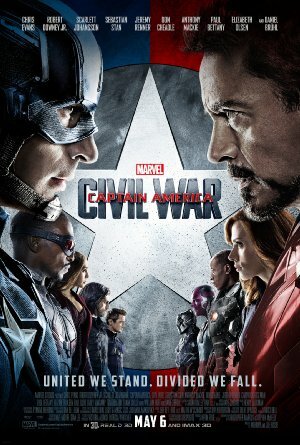 Civil War is the superhero film fans of superhero movies love. Tags: Chris EvansMarvelRobert Downey Jr.